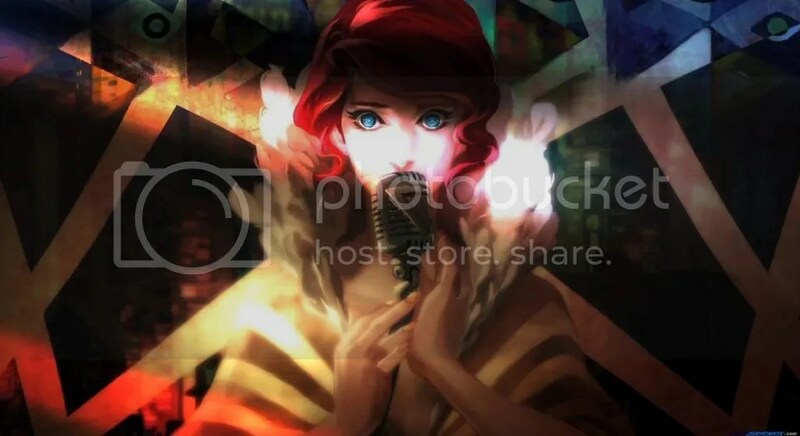 Transistor is a game whose mechanics are built around violent, loud close quarters combat. As Red, you have access to a growing amount of abilities for the Transistor, the AI/Sword artefact you inherit as the game opens. It’s brilliantly handled combat too; the Transistor giving you a chance to plan out your moves and attacks as time slows around you. It reminded me of the combat system in X-Com:The Bureau, but more fluid and graceful. After all, this is a game where throwing and catching the Transistor with a flourish is one of the first things you learn. But the combat is, for me, a bassline. What happens around it is far more interesting. Transistor is a game concerned with rhythm, both in music and life and what happens when that rhythm is disrupted. 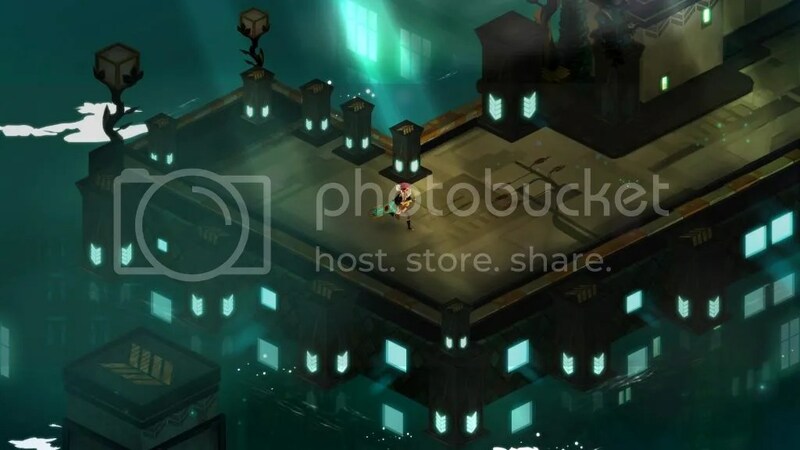 The entire plot of the game; the Transistor being used as a gateway to release Cthonic machine intelligence The Process, is based around the disruption of Cloudbank City’s rhythm and that idea is in the game all the way down to its cells. Cloudbank’s gradual clinical corruption is the most visible symptom and as the game goes on it only gets worse. The public terminals you find begin to degrade, the city begins to sprout sterile, precise mechanical fungus and eventually is lost altogether under a hail of white abstraction. That surgical disruption of rhythm is chilling, and as the game goes on, all pervasive. For a start, there’s the way the Transistor gains its abilities. The sword is able to store the memories of the recently dead and each one gives it an ability based on their lives. So, for example, a magician gives you the ability to hide yourself and a racer gives you the ability to teleport. The real genius of the game comes from the rich backstories these people have. A sky painter who was killled for painting the sky for her true love, a detective whose last case solved him, a community activist who got too good too fast. All these people have richly developed back stories and the only way to find them all out is to shift their abilities around inside the Transistor. In doing this, the game meshes the learning curve of its combat system with its narrative in a way that serves every kind of player equally well. It’s elegant storytelling, complex graphical music played with intelligence and wit. Then there’s the reasoning behind the Process incursion. It’s revealed that the Camerata, a bored society group somewhere between occultists and scientists, have manipulated the artistic stars of Cloudbank into their orbit to aid the Process or simply to see what happens when they feed them to it. Each victim is a shining light in their field and their deaths are left deliberately ambiguous. Some may have been folded into the process voluntarily, others were put there as a punishment and all of them are individuals even as they become nothing more than another weapon. A weapon you simultaneously exploit and assist. A dozen voices silenced, a city made a little more predictable, a little easier to Process. Again, it would have been easy to make the Transistor a generic super weapon. Here, not only do Supergiant gleefully refuse to ever fully explain what it is they also keep you in the dark as to the identity of its first victim. The game scatters hints as to who he, also the narrator is, and all of them are equally plausible. Red’s agent, an obsessed fan, just a man in the right place at the wrong time. Noir stereotypes wrap around the gorgeous design and Logan Cunningham’s gentle, sweet voice work to create an unforgettable character we never see but always hear. The Transistor is by turns funny, tragic, laconic and always desperately loyal. An early scene where something damages him is an emotional gut punch as you suddenly realize what he does for you; He’s your voice, literally and metaphorically and you wince every time he stumbles. It’s a remarkable, quiet piece of character writing that makes you care desperately from the first line spoken to the last line heard. The Transistor isn’t just a weapon, or even just the focused will of the Cloudbank survivors. It’s a single person’s total dedication to someone other than them. Love as a sword thrust. Devotion as a witty rejoinder. Then there’s Red, for whom the quiet is very personal. A singer, the singer, in fact, Red is a society figure and agent provacteur all in one. She’s a star with no audience, a woman alone on the stage whose voice has been stolen but whose hands are no longer tied. Red is the heroine of the game, and of Cloudbank itself. She’s a silent figure, the Transistor speaking for her even as she acts for it. Neither has any less agency for that co-dependency and it’s used to take you across the entire emotional scale of play. An early scene has Red return to the last stage she played. She’s unable to sing but the Transistor encourages her to hum and the deep, warm, low note that echoes out across the theatre speaks volumes. She’s still there, still Red. Injury isn’t ability, art can’t be stopped by Process. The entire soundtrack, by C. Darren Korb, is extraordinary but it’s the vocals, provided by Ashley Barrett, that pack the real punch. In combat mode, they’re all you can hear, Barratt’s strong, melodious voice humming the melody, picking up from exactly where the orchestral music cut off. It’s a metaphor and a character beat; we’re in Red’s head, she’s in control and the hum, deep and peaceful and thrumming with power, is the only statement she can make besides action. A singer without a voice is still an artist, just, in Red’s case, a martial one. But it’s the quiet that gets me and not just the lack of sound. The game’s final scenes, which I won’t spoil here, close the story out on a single word. The first line in the game is the Transistor’s. The last is Red’s, a single word that’s loaded with meaning, gratitude and love. It’s a quiet moment that echoes louder than every fight that comes before it and, in doing so, marks Transistor out as something wonderful. A game about violence and revenge that, in the end, is really all about the voices we raise and the music we choose to play. I doubt a better game will be produced this year and if it is, I can’t wait to play it. Until then, I’ll see you in the country.